Government Book Talk got quite a bit of traffic for last Friday’s review of Interrogation: World War II, Vietnam, and Iraq, so I thought it would be worthwhile to discuss another book just in from the National Defense Intelligence College. 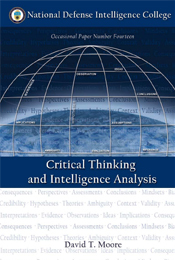 Critical Thinking and Intelligence Analysis is a study of the practice of critical thinking – which can be defined as simultaneously thinking and thinking about thinking as a means of an analyst “coming to a solution and improving the way her or she reasons.” Although the application of this reasoning technique to intelligence analysis is the focus of the book, the discussion of what critical thinking is, its advantages over either inductive or deductive reasoning, and its value in the analysis of a wide variety of problems and situations makes it a useful tool for academics, business people, or anyone else needing to analyze a particular scenario or set of evidence. Because I’m not a heavily abstract thinker, I found the author’s case study very useful in getting a better handle on how the absence of critical thinking can result in a major intelligence failure. Prior to the Cuban missile crisis of 1962, American intelligence analysts had received so much false or exaggerated information on Soviet military activities – including reports of Mongolian and Chinese troops – that they seemed to believe that any such reports had to be untrue. Disinformation on the part of the Soviets added to the analysts’ disinclination to think critically about the intelligence they were receiving, so the discovery of offensive Soviet missiles was a total surprise to them. The book also draws analogies to the failure of intelligence during the lead up to the Iraqi invasion of Kuwait and in the 2002 failure to detect the absence of weapons of mass destruction prior to the second U.S. war with Iraq. The verdict: an excellent textbook for the teaching of critical thinking (there’s a syllabus in the Appendix) and a very interesting take on a crucial episode in Cold War history. You can read it here and buy it here. To find it in a library, go here. This entry was posted on Friday, June 11th, 2010 at 8:59 am and is filed under Defense Intelligence Agency. You can follow any responses to this entry through the RSS 2.0 feed. You can leave a response, or trackback from your own site. It has only one photo, and it’s an aerial surveillance shot — no people. This is more of a policy book than a history, but it does say a lot about how the crisis developed. Thanks for commenting! My husband was on the USS Remy during the Cuban Missile Crisis. I was wondering if there are any photos included as he is constantly searching the internet trying to find things about this event that he faced when just 17 years old. This would be a great book for him to read, regardless, but I was just wondering.